GBS' Laser Printed 'Band on a Sheet' (BOAS) consists of polyester wristbands and labels that are made with resilient paper material. The wrist bands are by far the most comfortable lightweight bands on the market while cost saving labels are easy to peel and adhere to patient charts and records. Our wrist bands and labels can be run through color or black and white laser printers. 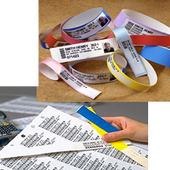 You can create your own ID wrist bands on demand by using your in-house patient identification software system or our EasyID® software to print photo images, text, 2D or 3D bar codes. Wristbands are waterproof and and does not need a laminate overlay to protect patient information from smearing and bleeding. Get the latest in Laser Wristband Technology. Our wristbands easily replaces other major brands and are standard when it comes to convenient solutions to adult patient security. The Laser bands are tamper evident and are tear resistant. It has an average life of several days with a security feature and must be cut off to be removed. The surface is excellent for black and white or color laser printers. The material is also excellent for bar code printing from laser printers. It is ideally suited for the Health Care Systems for patient care, laboratories, and admissions. Printing can be achieved by out single sheet that easily allows you to print both wristbands and labels at the same time from the same laser printing tray. This allows a one-stop process to a Positive Patient Identification. The Laser band and label sheets are manufactured in the USA and samples are available now. GBS can help ensure patient safety and make your staff's life easier. There are many things to consider when selecting patient wristbands to meet your facility's needs. Multiple departments are often involved in the decision-making process and will be instrumental in the day-to-day use of our products. GBS' Patient Identification Specialists will assist you to find the right solution for your needs. With so many wristband options and many things to consider, it is important to evaluate your needs for the best patient identification solution. Furthermore, GBS products and EasyID® software applications integrates seamlessly with your current ADT system to eliminate duplicate data entry. To learn more about our Laser Wristbands, go to our Laser "Band on a Sheet" (BOAS) page.